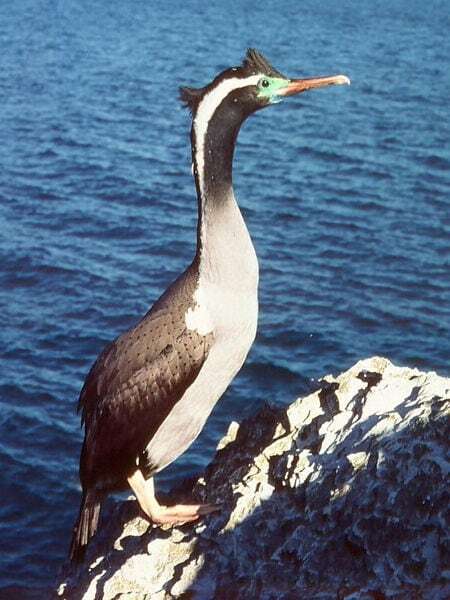 There are at least three species of shag in Abel Tasman National Park. 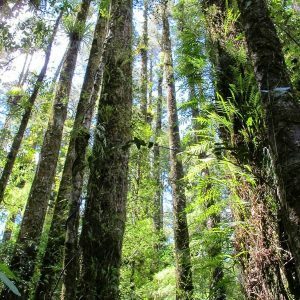 Each is quite different, both physically and ecologically, so it is an interesting challenge to distinguish between them. All shags feed by diving from the water surface using their webbed (extending to the hind toe!) feet to swim after a variety of fish prey. This is clearly the most common. Rather than the normal black and white plumage these rather slender birds are characterised by grey plumage, covered in black spots on the upper parts. The adults have a broad white stripe down the side of the neck and rather striking double crest on the top of their head. Their behaviour is even more of a giveaway, roosting or breeding on bare rock ledges next to the coast and flying in skeins, close to the water, to and from their marine feeding grounds. 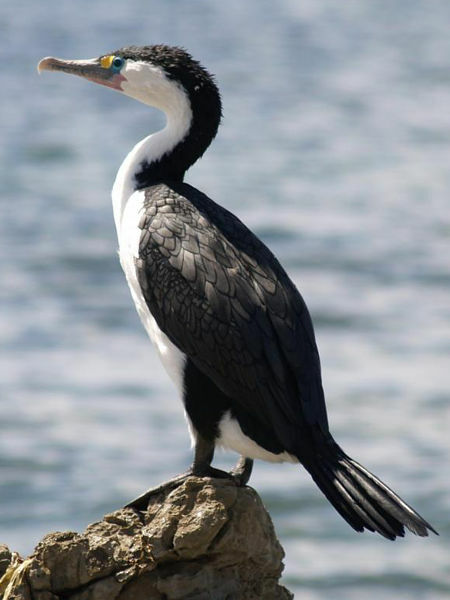 Spotted shags are found in the marine environment only, never venturing into freshwater. It is interesting how the number of spotted shags has increased in these waters. Early naturalists recorded them breeding on the seaward cliffs of the Tata Islands but now they breed along much of the coast where they can find a suitable ledge. 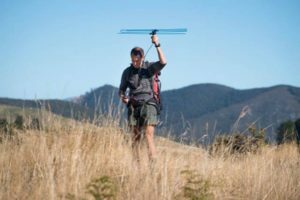 This phenomenon has extended throughout Tasman Bay and into the Marlborough Sounds. Apart from the breeding birds there is also an influx of spotted shags during winter. These non-breeders roost in big flocks on the coastline. One theory is that these birds come from the Banks Peninsula colonies that have doubled in size over the last 30 years. Spotted shags provide an amazing sight at Tata Beach at dawn when hundreds of birds arrive to bathe en masse in the shallows and then waddle onto the sandy beach where they regurgitate little piles of stones from their gizzards. Yet something else we don’t understand well – are these stones used as ballast or are they used to aid digestion or even dislodge their parasitic worms? Each year we see quite a few spotted shags washed up dead on beaches in Tasman Bay and Golden Bay. The birds are emaciated and often with internal parasites. The cause of this is not understood—perhaps a natural regulation of numbers as they become too numerous for the available food supply. This is a big stocky bird and distinctively all black on the upper surface and all white on its underparts. Usually seen alone or in small groups apart from the breeding colonies. 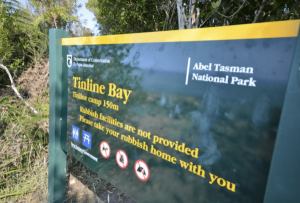 There used to be a colony in Abel Tasman, in the upper branches of beech trees, quite close to the track at Falls River. I haven’t seen this recently and wonder if it still exists. The pied shags breed over several months in summer and it is often possible to see a nest with young birds. In coastal Nelson these birds created a problem as the colonies became bigger, noisier and smellier. Pied shags are found inland on the larger rivers and lakes, but just as commonly on the coast, as in this national park. The name says it all. This is our smallest shag and it has several different colour variations. The juveniles are entirely black but adults are black with either an entirely white front or just with a white throat. If this gets confusing, remember that the little shag always has a short stubby bill (yellow for the adults) and a long tail. The relative proportions of bill and tail are quite distinctive. 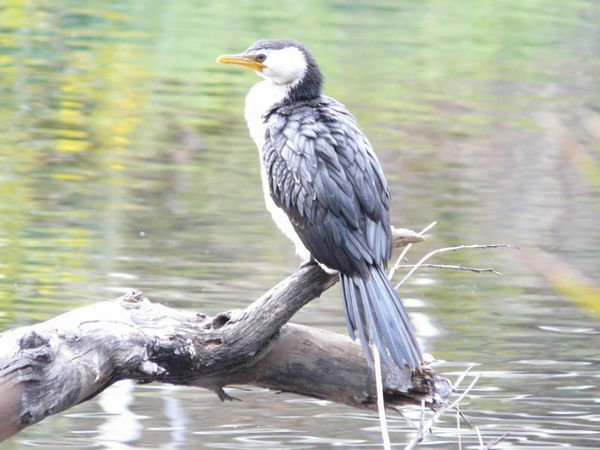 Like the pied shag this one is equally at home in coastal and estuarine waters or in freshwater. As with all shags it is a colonial breeder sometimes in association with the black shag. It is a bit of a mystery as to where little shags breed locally. There is a colony in Croisilles Harbour but there must surely be something closer. Once you are familiar with these three species you may want to learn how to identify the black shag and the little black shag.